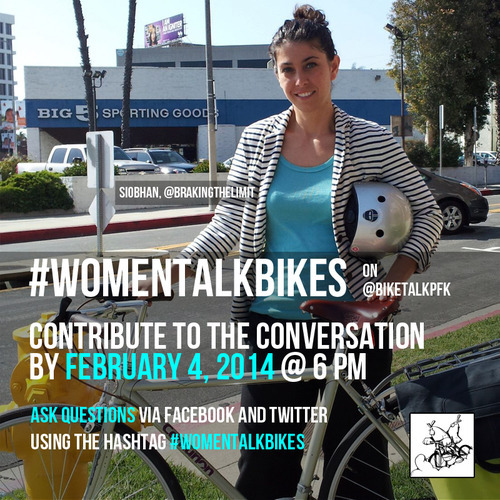 This month, Bike Talk, a KPFK and KillRadio.org podcast, hosted 9 amazing women to discuss women and biking. I was thrilled and honored to be included in this podcast. We discussed issues from safety to cat-calling and everything in between. The group consisted of ride leaders, social justice leaders, and community leaders – read everyone’s short bio on the website. I feel each of these women is forging a new LA that is equal, fair, safe and enjoyed by bicycle. Give a listen to the podcast here. It’s not long but it’s well worth it. This entry was posted in Who We Are and tagged bike talk, biking, kpfk, los angeles, podcast, women and cycling, womentalkbikes on February 20, 2014 by womenskit.